Year One have done some fantastic music learning this Autumn term. Through listening activities, song, movement and performance, the Tigers, Leopards, Panthers and Lions have gained a strong awareness of ‘musical pitch’. As a pre-cursor to the keyboard, the glockenspiel is a fantastic musical instrument for young music learners. Children can visually access each pitch and see the size of the keys decrease up the instrument as the pitch gets higher. Having established the importance of playing on the beat of a piece, children could begin to play patterns of different notes. The different coloured keys meant that all children could read “colour scores”, which meant that without too much preparation, we could play simple melodies relatively easily. By using these ‘colour scores’, children have developed key music reading skills which can be developed later in their learning. They loved being able to play recognizable melodies by simply playing the correct coloured note on the beat. By using the colours of the glockenspiel keys, children were able to compose their own pieces of music. As a composition technique we explored the idea of creating repeated patterns, a skill which is an integral part of the Year 1 maths curriculum. 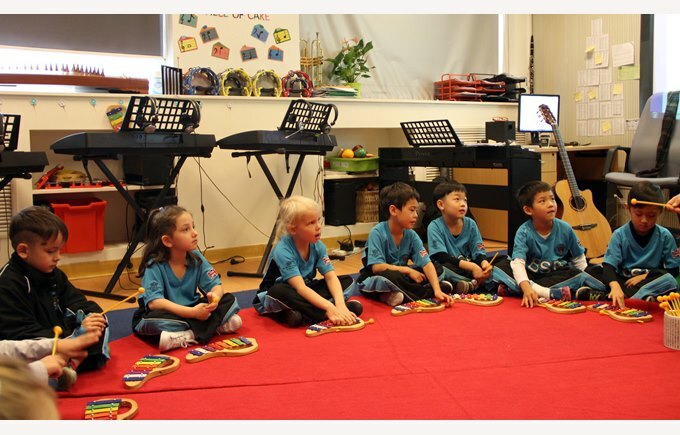 Children used their skills to create repeated musical patterns and were able to use their own creativity to decide which notes they wanted to use in their patterns. As we approach the festive period, we can use our music reading skills to play some Christmas songs on the glockenspiel, an activity which never fails to bring joy to all of the children.